RUGBY: FOLLOWING the driest September since records began almost 100 years ago, Saturday morning dawned with rain forecast and hopes of a softer playing field for Woking. However, the hosts were under no illusions that their Second Round Junior Vase tie with Bognor would be soft in any way. Bognor kicked-off with the expected aggressive dominance, hitting the rucks hard and soon had Woking on the back foot. The physicality of the Bognor pack combined seamlessly with the speed of their backs to keep Woking pinned deep inside their own half for the first 30 minutes. “It was only the sheer dogged determination of their defence, mustering all the skills developed over the summer break, that kept them in the match and the Bognor tally to a mere 14 points. From the restarts Woking fought back, winning some good ball. However Bognor were quick at the rucks and easily turned the play over as Woking were slow to clear out, albeit not always legally, costing them six points. As the half ended Woking’s burly No8 John Stedman took a crash ball but came up just short of the whitewash. However, the ball was quickly spun wide into the hands of Justin Dougherty who went over for Woking’s first try, making the half-time score 26-13. Working through the phases Woking trundled up the pitch at the start if the second period, keeping the ball in the pack. It was only a catalogue of errors which stopped the home side capitalising. A speculative chip kick over the defensive line by Mike Aitchison almost paid dividends as the ball landed neatly in his hands, leaving him with a clear view of the line. Yet he followed it up with a wild overhead pass into the surprised hands of the opposition. As the game entered the final stages Woking were awarded a line-out deep inside the opposition 22. Taking a quick ball into the hands of Matt Childs at the front of the line, they set up a rolling maul which the Bognor pack were unable to defend against. Jim McGiven was the man to claim the try. Bognor immediately hit back to close the game at 38-18. 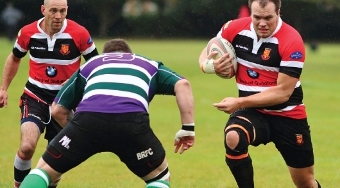 Captain Aitchison said: “It was a much improved performance against a strong side from higher up the leagues.